Afrovibes Festival brings some of the very best South African Arts to Newcastle. Afrovibes’ programme, the biggest ever, marks 20 years of South African freedom: 20 years since the ending of apartheid and the beginning of democracy. Making a welcome return to Live Theatre, this year Afrovibes Festival extends to Northern Stage for the first time. Work by award-winning artists reflects what it is to be part of 21st century South Africa, which promises to be thought-provoking, energetic, refective, fascinating and wonderful. Mamela, (Tuesday 4 to Saturday 8 November) a play developed by Live Theatre and Curious Monkey which tells the true stories of remarkable young South African women. Join Director Amy Golding and the cast for a post show discussion about the making of the play after the Tuesday 4 November performance. 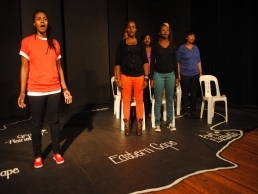 Live Theatre will also host The Soil, (8pm, Friday 7 November) an award-winning a cappella group from Soweto. There will be a free play reading of Elusive Spring, a play written by one of South Africa’s leading playwrights, Mike Van Graan on (2pm, Saturday 8 November). A political thriller in development set in post-colonial South Africa it interweaves the stories of a local journalist who becomes dangerously enmeshed in political intrigue. The reading will be followed by a Q&A session with the cast. One man show Skierlik (4pm, Saturday 8 November) is written and performed by Phillip Dikotla one of South Africa’s leading playwrights.This emotional play revisits the after effects of racially motivated shootings on a remote settlement. Audiences will also be able to join Phillip M. Dikotla that morning for a free writing workshop on writing theatre of the oppressed. Afrovibes events at Northern Stage include Biko’s Quest, (7.30pm, Friday 7 and Saturday 8 November) a spectacular, vibrant and powerful dance piece and Rainbow Scars (6.30pm, Thursday 6 November) in which Mike Van Graan, one of South Africa’s leading playwrights confronts the question of racial identity head on.